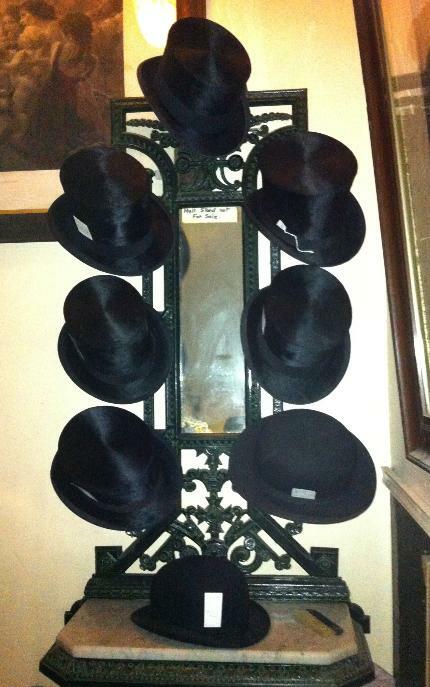 The next photographs feature some of our shop window displays. Silver plated toast racks and tea sets, chamberstick, silver plated candlesticks, sherry and champagne glasses glass cake stands. 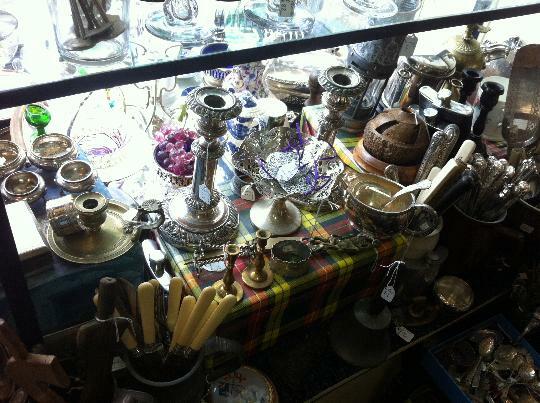 Silver plated candlesticks, sauce boats, toast rack, cake stands, cut glass decanters, gilt bronze lamp. Silverplated cruet sets, Pair of Silver Plated Coasters, Candle sticks, Glass Cake Stands,Tea sets, Egg cups, Silver plated tea set, Sunderland dumps / Paperweights, Vintage 1940's Handbags. 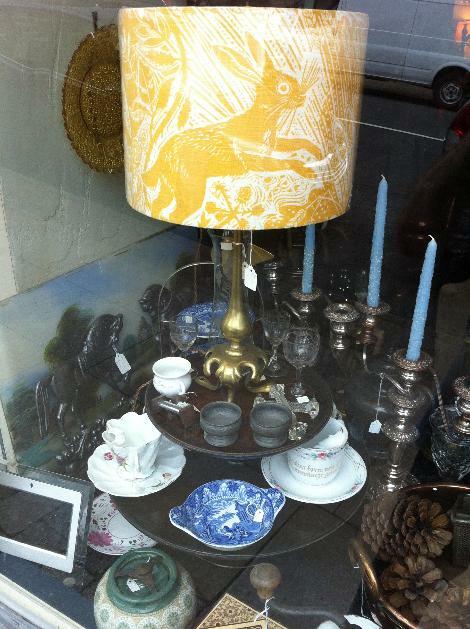 Silver plated candelabra, cast iron horses, brass table lamp, pewter salts, sherry glasses. 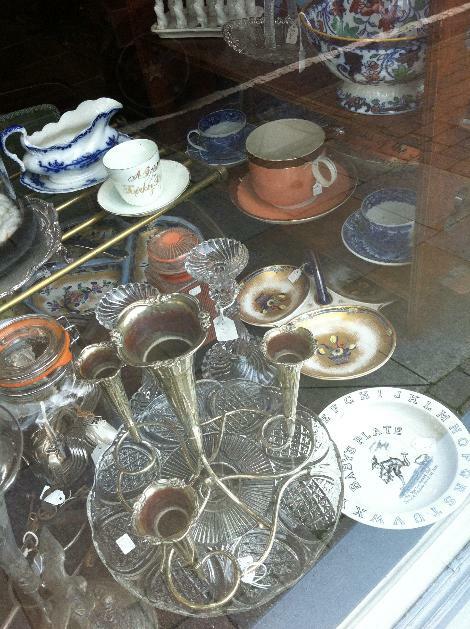 Victorian and Edwardian glass / pottery, Silver plated Antique epergne stand, childs bowl, Edward Moore candle sticks. 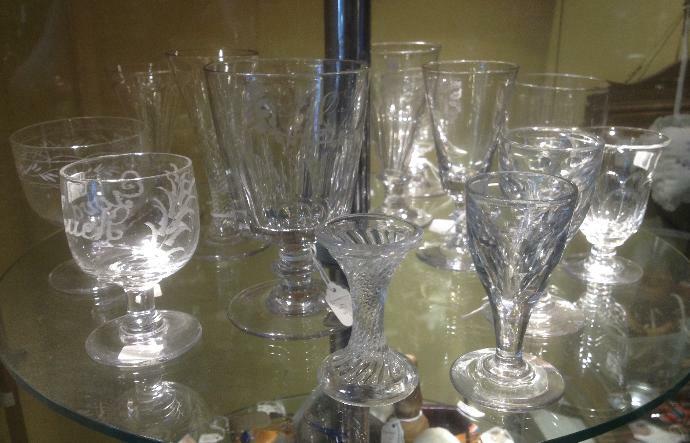 A large seletion of Victorian Rummers always in stock from a single pub glass to sets 6 / 12 fine table glasses and Champagne Glasses. 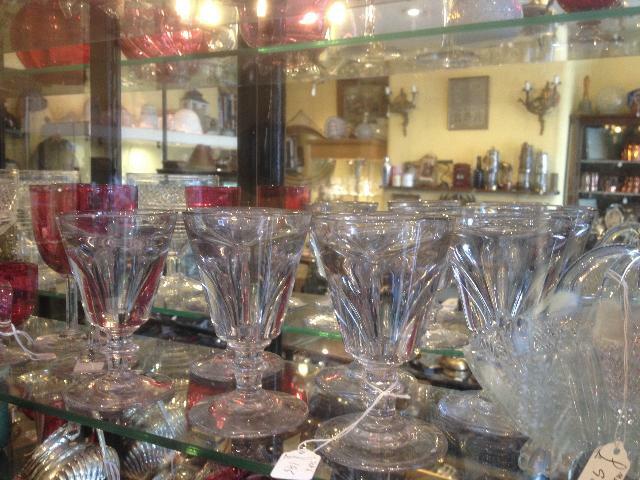 Custard cups, Whisky glasses, Wine glasses, Cranberry Glass, Cut Glass Cruet Sets. 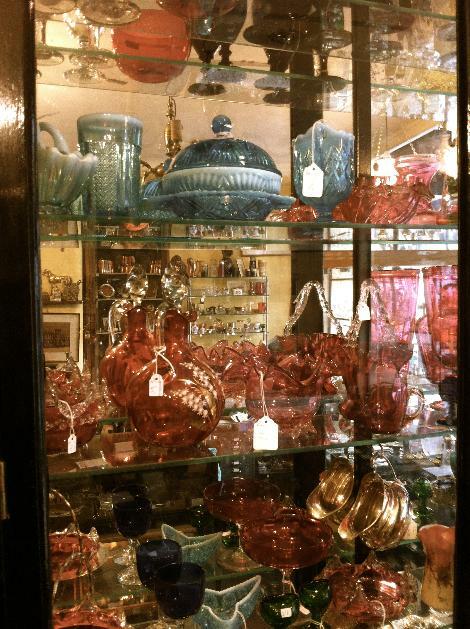 Victorian and Edwardian Cut Glass Decanters, Cranberry Glass, Finger Lamps, 1930'2 Light Bowls, Early Victorian Pottery Jugs. Antique,Cut Glass Decanters, Antique Glasses, Antique Rummers, Antique Pub Glasses, Antique Champagne Glasses Flutes, A Large Selection of Victorian Cranberry and Antique Ruby Glass, Davidsons Pearline Glass. Victorian Cranberry Ruby Glass, Glass Walking Sticks, Costume 1930's - 50's Jewlery, Vintage Compacts, Vintage Handbags, Picture frames, Rouge Pots, Sugar Baskets. 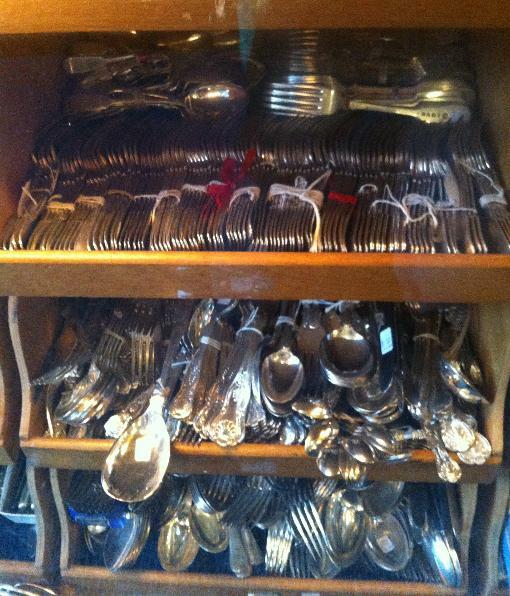 One or Two Salt Spoons, Mustard Spoons, Bone Egg Spoons, Glove Stretchers, Silver Button Hooks, Serviette Rings, Thimbles. Sewing / Needlework items, Knitting sheaths, Thimbles, Hatpins, Silver Chatelaine, Tartanware, Silver and Chainmail Purses, Carved Nut Sewing Items and Thimble holders. Small Silver and Christening Items, Inkwells, Silver Mustard Pots, Rouge Pots, Antique Silver Christening Spoons, Silver Christening Mugs, Antique Silver Cream Jugs. Antique Silver Picture Frame, Pair Antique Silver Picture Frames, Antique Copper Victorian Jelly Molds. Antique Brass Picture Frame, Vintage Lighters, Tartanware, Mauchlineware,Inkwells. 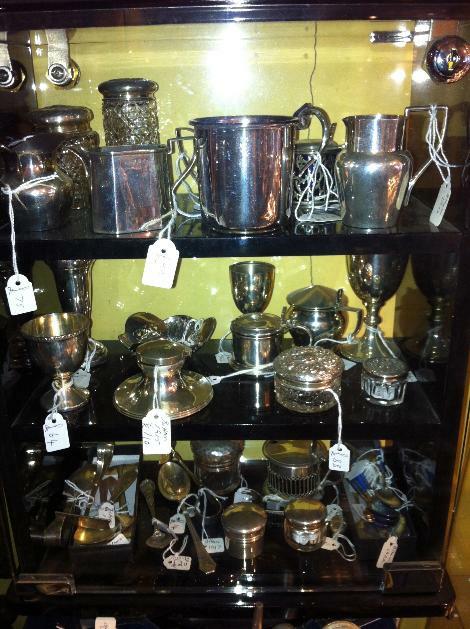 Antique Hallmarked Sterling Silver picture frames dating from 1890 to the 1930's in a variety of shapes and sizes. Antique Hallmarked Sterling Silver Sugar Castors, Antique Silver, Silver Christening Mugs, Silver Vases, Antique Silver Candlesticks. One of the many interesting cabinets in our shop sewing items, pin wheels, vintage cigarette and cigar holders, coquilla and corozo nut needlework items tape measures. Antique Silver Sugar Casters, Antique Silver Inkwells, Silver Cigarette Box, Silver Soap Box, Antique Silver Bon Bon Dishes. 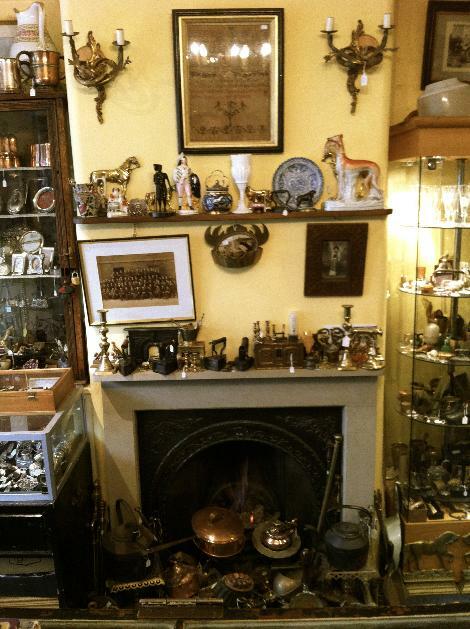 Copper and Brassware around Victorian Cast Iron Fireplace, Lace irons, Copper and Cast Iron Kettles, Brass Fireside Ornaments, Pewter Tankards. A Good Pair of Silver Candelabra, Georgian Silver Cream Jugs, Georgian Silver Wine Funnel and Sugar Casters, Novelty Animal Silver Pin Cushions, Antique Silver Elephant, Silver Peppers and Pepperettes. Silver Cutlery in various patterns Old English, Fiddle, Rattail, Kings, Queens, Antique Silver Serviette Rings, Silver Asparagus Tongs, Antique Silver Salvers, Georgian Silver Stilton Scoop. We Stock a large selection of Silver and Silver Plated Cutlery in various patterns Old English, Fiddle, Rattail, Kings, Queens. 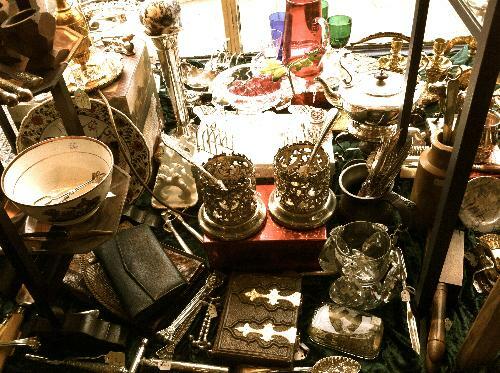 Silver mounted Antique Match Strikers, Silver Curling Tongs, Amethyst Glasses, Silver Topped Dressing Table Boxes, Silver Handled Magnifying Glasses. Large Silver Plated Antique Soup ladles, Sauce ladles, Stainless Steel Knives, Steel Knives, Horn Knives, Vintage Steak Knives. Part and whole canteens always in stock. 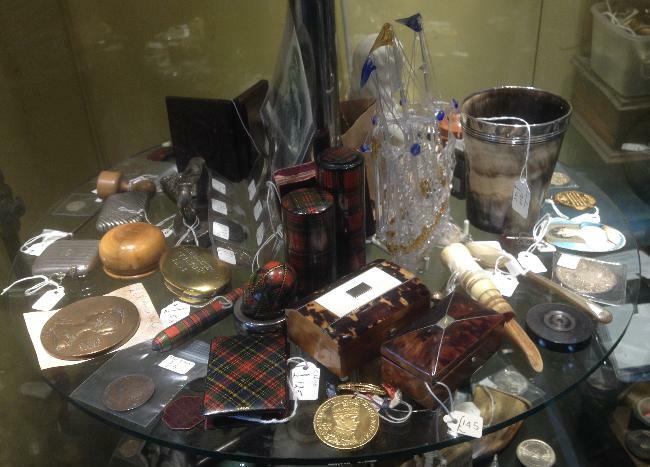 Tartanware, Treen, Mauchline ware match strikers, money boxes, horn beakers and snuff boxes. Antique Silver Christening Mugs, Silver Salts, Victorian Silver Coasters, Silver Mustard Pots, Silver Vases. 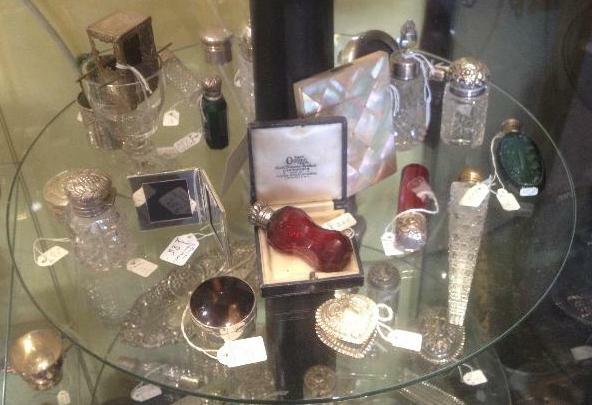 A Pair of Silver Salts, Silver Napkin Rings, Antique Silver Inkwells, Silver Dishes. 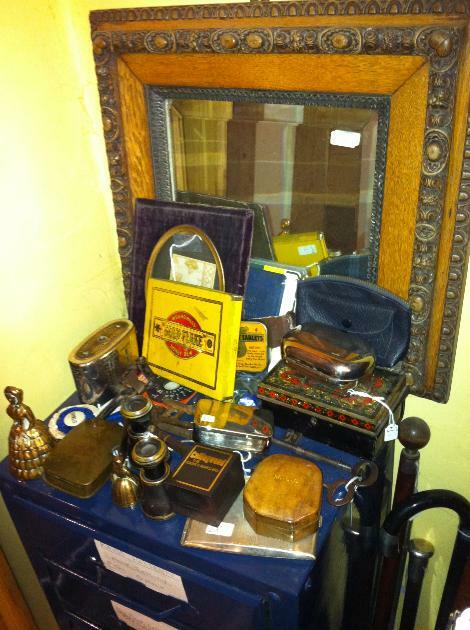 Snuff boxes, Silver Nurses buckles, Silver chairs, Dental boxes, hat pins and sewing items. 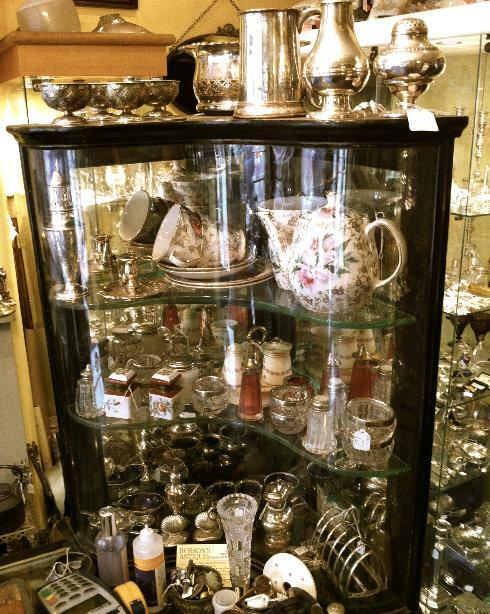 Victorian and Edwardian Antique Silver Topped Cut Glass Antique and Vintage Perfume Bottles. Large Silver Topped Hobnail Cut Perfume Bottles. 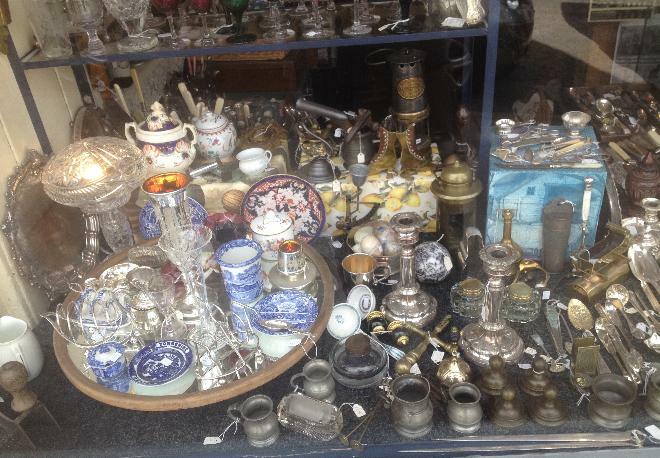 Silver Topped Antique Perfumes, Silver Bon Bon Dishes, Silver Egg Cruet, Enamel Spoons, Double Ended Perfume and Smelling Salt Bottles. inscribed "Charlotte", Bone Apple Corer, Glass frigger. 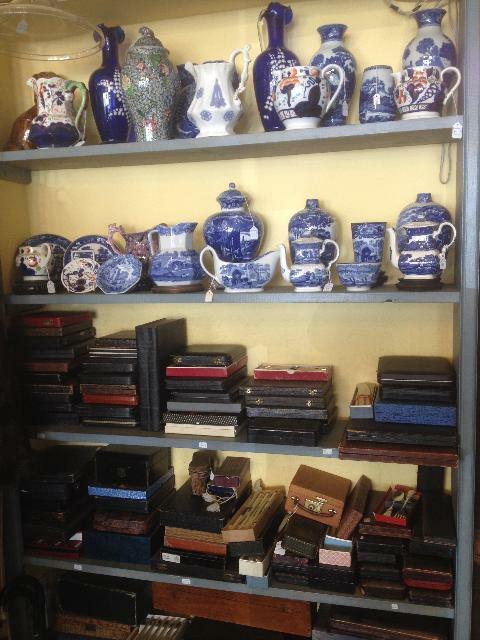 A good selection of blue and white pottery always in stock both decorative and dinnerware Spode Italian, Wedgwood, Adams, Losol and so on. 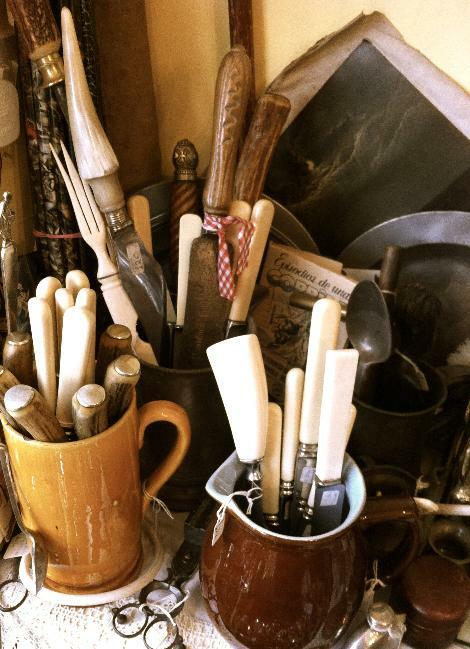 Boxed sets of cutlery from full canteens to carving sets, fish eaters and servers, fruit sets, cake knives and forks, tea knives, tea/coffee and grapefruit spoons and many more. 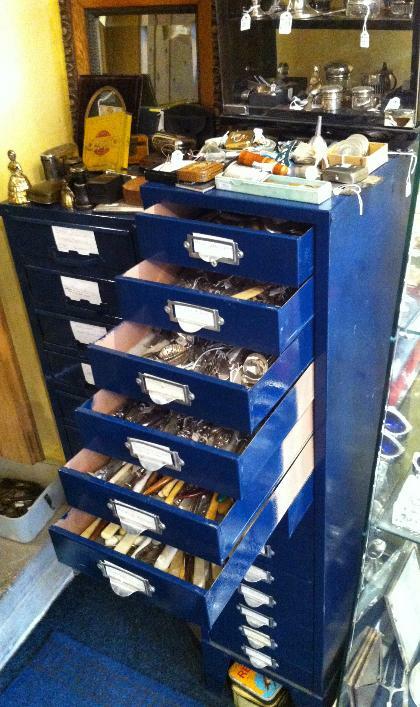 Boxed sets of Silver plated and Antique Silver Cutlery from full Canteens to Single Forks, Spoons, Knives, Antique Steel Knives, Bone Handled Knives, Old English Silver Plated Cutlery. 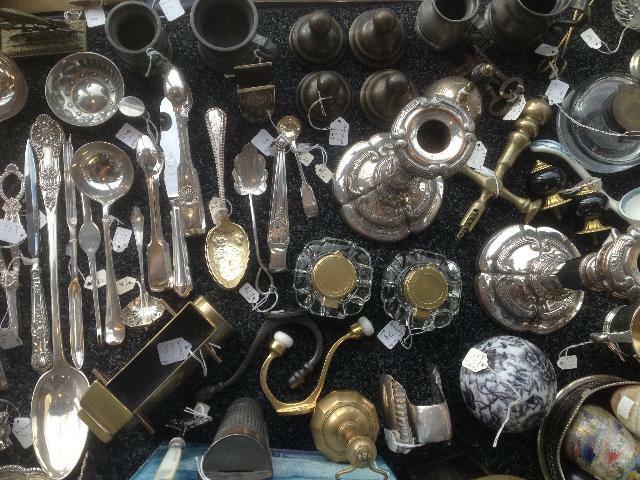 Victorian School Hand Bells, Miners Lamps, large basting spoons, grape scissors, Carving Knives, Chamberstick,old Sheffield plate and pewter. Georgian Ale Glasses, Hollow Stem Champagne Glasses other Early Glasses. Georgian Ale Glasses, Wrythen penny lick, other Early Glasses. 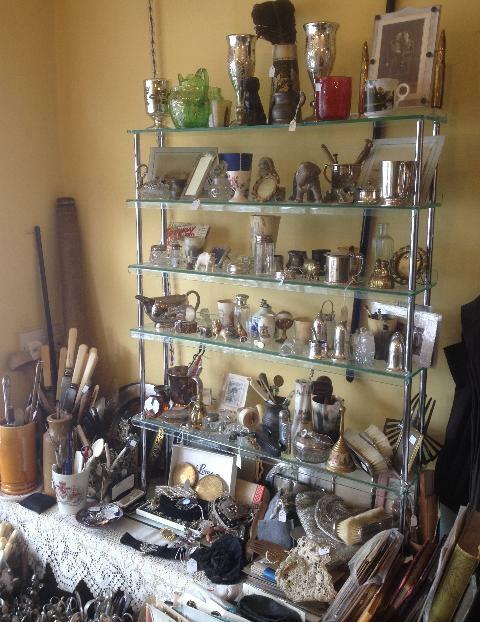 Medals, pique ware, silver nurses buckles, snuff boxes / mulls Old Sheffield plate candlesticks, inkwells, pilgrim flask, carpet bowl, bronze pastery jagger, sugar tongs. Treen, butter stamps, copper luster, butter rollers, string box. 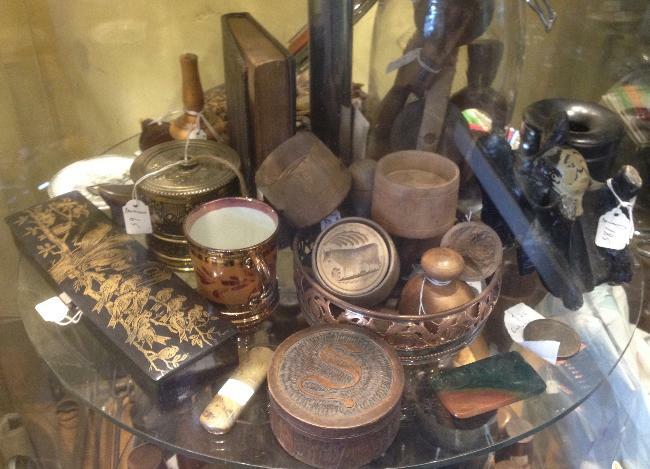 Brass moulds, Lace irons, Snuff boxes, Champagne Taps, Slate Shoe, Traveling Inkwell. Minature Shears, Copper Chocolate Moulds, Corkscrews, Cast Iron Glue Pot, Brass Weights, Bronze Mortar. 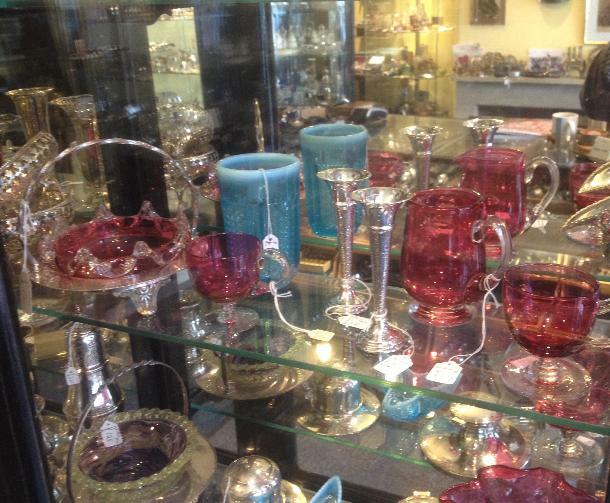 Silver bud vases, Cranberry / Ruby Glass Victorian custard cups, Cranberry cream jug, glass sugar baskets. Silver and Enamal Coffee Spoons, Cranberry Glass, Gold Rings, Perfume Bottles, Coral Beads. 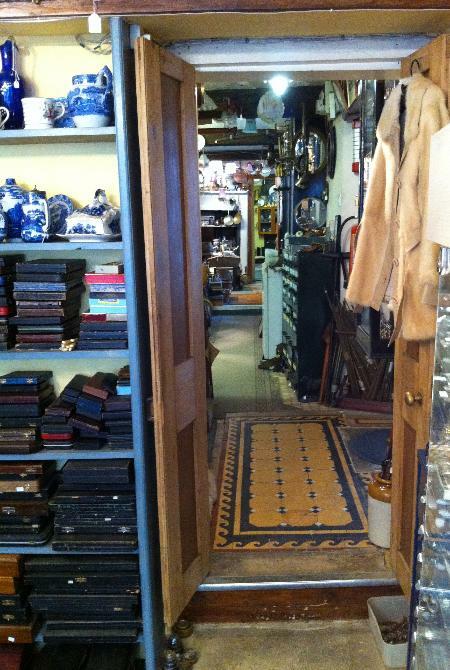 See Left, Antique and Vintage Knives, Carving Knives, Horn Handled Knives, Pewter Plates. 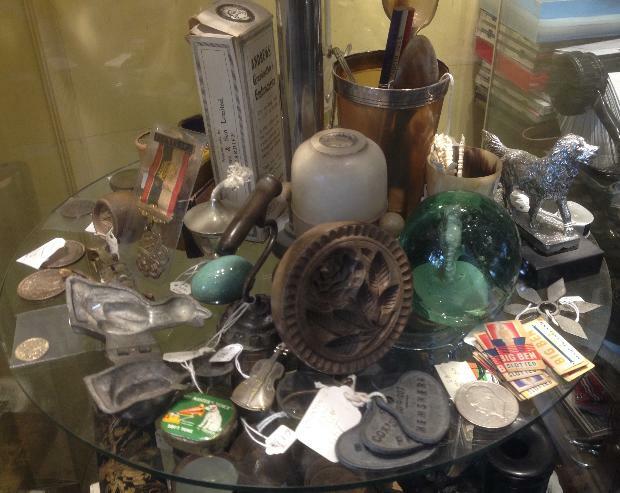 See Right, Vintage Tins, Ebony Canes, Binoculars, Silver Topped Canes. 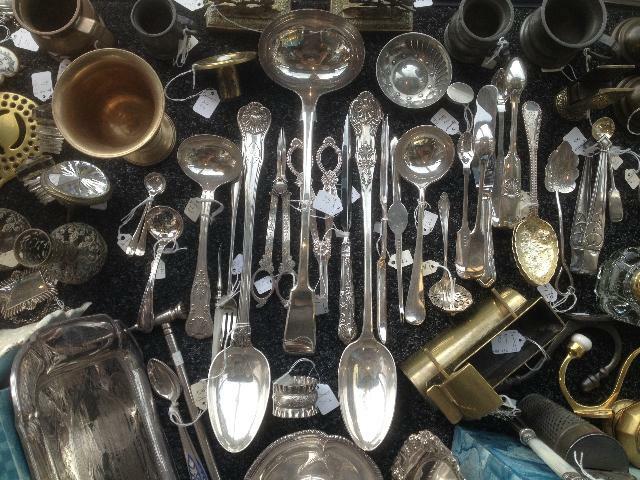 We have a large selection on serving cutlery, Vintage Jam Spoons, Antique Pickle Forks, Silver Sugar Tongs, Silver Plated Coffee Spoons, Antique Bread Forks. Vintage Tea Sets, Vintage China Cups and Saucers, Cruet Stands, Pepper Pots, Salts, Antique and Vintage Silver Plated Toast Racks, Inkwells. Travel the original Victorian tiled passageway into the back shop.